Social media marketing success doesn’t take place over night. It’s a cumulative process that produces success with persistent and consistent execution. Your first step in social media marketing is to develop a strategy that defines your target audience and how you will reach them. Once you've developed your social media marketing strategy, the success of your efforts is dependent on your execution. Here are 7 hot tips for executing your social media marketing strategy. If you’re not investing, at a minimum, the equivalent of 25% of a full-time employee daily to execute your social media marketing strategy, you likely will not get the results you need and expect. Your social media manager should be measuring, communicating, posting, responding and analyzing your social media marketing every day. Now that you know who you want to reach and where you plan to find them, you need to develop an editorial calendar that identifies the content and message you want to communicate over a 3-month period. Your social media editorial calendar should be developed hand-in-hand with your content calendar, promoting the blog posts and content offers that you will be publishing. While you have a 3-month editorial calendar, it's important to execute it daily so that your communications are timely and reflect the current news. If you plan to tweet about Miley Cyrus twerking at the MTV Video Awards in a month, people will already have forgotten about it (like you probably have!). Your audience will quickly tune you out if all you talk about is YOU! While it’s entirely appropriate to share your blog posts and landing pages on social media, you need to be helpful above all else. How can you do that? Simple – post interesting content from other sources (trade journals, business press, etc.) that your ideal customers would find valuable. Kipp Bodnar and Jeffrey Cohen, authors of the B2B Social Media Book, have developed a formula to optimize your social media posting called the 10:4:1 rule. For every 15 social media posts, 1 should be a link to one of your landing pages, 4 should be links to your blog posts and 10 should be helpful content from other sources. This is a good mix of content that lets you sell and promote your solution without coming off like a used car salesmen. While you’re focused on optimizing your company’s social media marketing channels, have your sales and management team amplify your efforts with their personal accounts. For example, if you’re publishing a new article on your company blog, encourage your sales team to share it on their personal LinkedIn accounts. It’s a win-win proposition – they’re trying to sell and the content you’re producing should help them generate leads and develop a reputation for thought leadership. Social media is all about sharing. Make sure you have "follow" buttons on your website, email signatures and marketing collateral. Make sure to include “share” buttons on your email marketing, landing pages and blog articles. Most email marketing and internet marketing software products have share and follow modules that make it easy for you to include them. Take advantage of them! What better way to learn what’s important to your prospects and customers than to see what they say on social media? 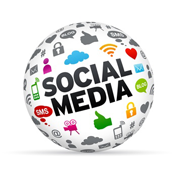 Follow your customers on their social media networks and see what they have to say. This will give you insight into what’s important for them in running their business. We highly recommend the new Signals tools from HubSpot, which gives sales professionals insight into their top prospects. These metrics will help you determine which social media networks work best for your business. Do more of what’s working and either jettison or reconfigure what isn’t.